Last week I had the pleasure of afternoon tea with an old school friend, it could be said that our catch up was long overdue. Some 29 years since we left school and last saw each other but it’s funny how life pans out. Towards the end of last year Donna contacted me, she had been diagnosed with bowel cancer, my openness with my cancer means (hopefully) that people can feel free to ask me anything, I’m very open and very honest about what I went through. There will always be questions buzzing round your head after a shock diagnosis. Some I can answer, some sadly I can’t. Donna had to have surgery very quickly, her protocol was different to mine. I had chemotherapy, radiotherapy and then the AP resection. Donna had bowel surgery, then lung surgery and is now (as of today) half way through Chemo. There are a few different types of bowel cancer. You could say I got lucky with mine, mine was an older persons cancer, a slow growing one. Mine had been a tumour for about 5-7 years (yes, it did cause symptoms all that time, bleeding, excruciating pain, change in bowel habits and yes I was back and forth to the doctors for a long time but always told the same thing, piles and IBS. And as far as I’m aware Fybogel and Preparation H are not a known cure for cancer). Donna’s Cancer was a faster pace grower, sadly that tends to be the case the younger you are. Donna’s surgeon was able to cut and shut her bowel without the need of a bag, even though she had a very large tumour by the time it was found she had enough spare bowel either side to reattach it. Well you know what they say it’s all about location, location, location. While going through all this horrible experience she had enough space free in her heart and mind to think of others, while most of us (myself included) would be running round like headless chickens, she found time to have her beautiful long hair cut short and donated a large pony tail of hair to a charity that makes wigs for children with cancer. People going through cancer hate being told they’re brave or a hero, because when you’re going through cancer you don’t feel brave or heroic, you just keep ploughing on through treatment with the hope it’ll all turn out for the best. But thinking of others while you’re going through such a traumatic time makes you pretty darn close to being a hero in my book. If the symptoms are present, and I for one know mine were extremely present for many years then please let’s stop this too young crap and start checking for nasties. My advice now, is if you’re really not happy with what you are being told by your doctor, go back and insist on further investigation. It was a really lovely afternoon and a very very nice afternoon tea. It was rather a foodie week as it happens, Matt invited Chris and I up to London for a meal to surprise our friend Kim. From Kim’s point of view, not knowing we were there she saw two “weirdo’s” sitting, completely obscured by said menus, she was just about to tell the waiter she’d rather sit as far away from those two as possible when we revealed ourselves much to her delight. Not least because she didn’t have to sit near two such oddballs. Hahahahaha. I think I have convinced Kim that this is how menus should be read. I needed to wear a dress, although my afternoon tea earlier in the week had been delicious the carb loading and sheer gluttony on my part had caused a bit of a belly ache, so the thought of wearing trousers didn’t appeal to me. 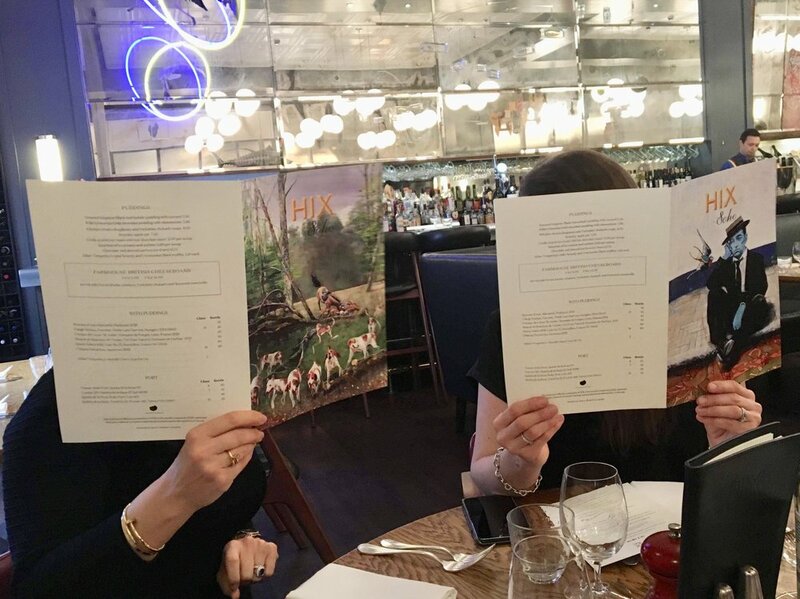 The food in Hix was amazing. And with yet another heavy belly we headed off home. Who doesn’t want a brunch feast and a firework in a cake for their birthday I say! Top from The White Company, Jeans from Topshop, Twins from Kim. This week I’m off on my travels again. Flying out to Spain later today.